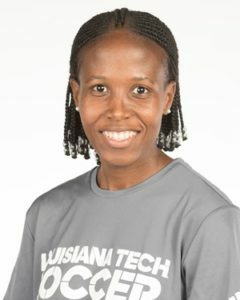 You don’t need a Geographic Information Science (GIS) degree to find Polokwane, South Africa, home to Louisiana Tech GIS senior Mapula Nomvula Kgoale. “Four hours from Johannesburg, which is one of the big cities in the country apart from Cape Town and Bloemfontein,” said the senior soccer star. It’s a good thing Louisiana Tech found Nomvula, who has scored as both a student and an athlete. She’s a two-time All-Conference USA soccer star, has been named to both the Conference USA Commissioner’s Honor Roll and All-South Region Scholar twice, and is a member of the 2017 C-USA All-Academic Team. She also spent a year at Lindsey Wilson College and led the Blue Raiders to an NAIA National Championship. This is her third and final year at Tech. She’s been about service at Tech, too; Nomvula serves as secretary of the University’s African Student Association (ASA). Geographic information science might sound like a foreign language, but simply it’s a scientific discipline that studies data structures and computational techniques to capture, represent, process, and analyze geographic information. It’s about data and knowing how to gather and use it. What she’ll do with her degree is a ball that Kgoale is still kicking around, and very honestly.